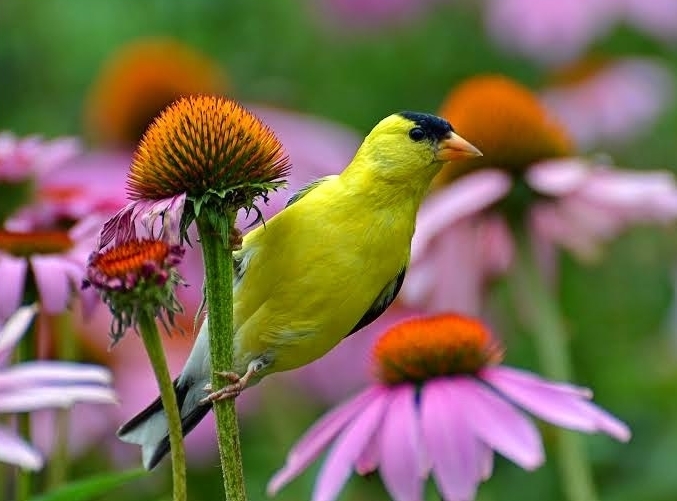 Working in the garden in the summer can be a delightful experience when we pay attention to the sounds of the birds. It’s educational and entertaining to concentrate on birds sounds and look for the stories behind them. You’ll be surprised at what you can learn just by listening, finding joy in the process. A Morning In the Garden: The Birdsong Begins! 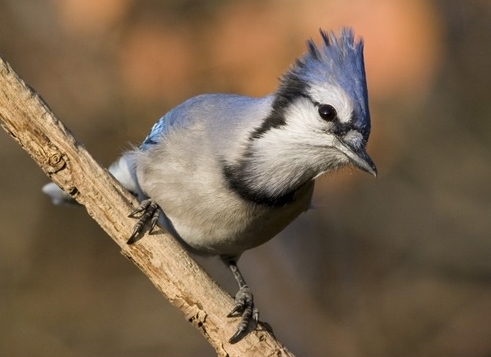 This morning I heard a conversation between a family of Blue Jays, murmuring to each other with a tone that reminded me of an interplay between The Three Stooges. They seemed to be comparing notes about where they would go to find food. Later, I heard the familiar “Jay! Jay!” Were they sounding the “jay alarm” for the good of the group, because of a threat of some kind? Or was this practice just a “fire drill”? 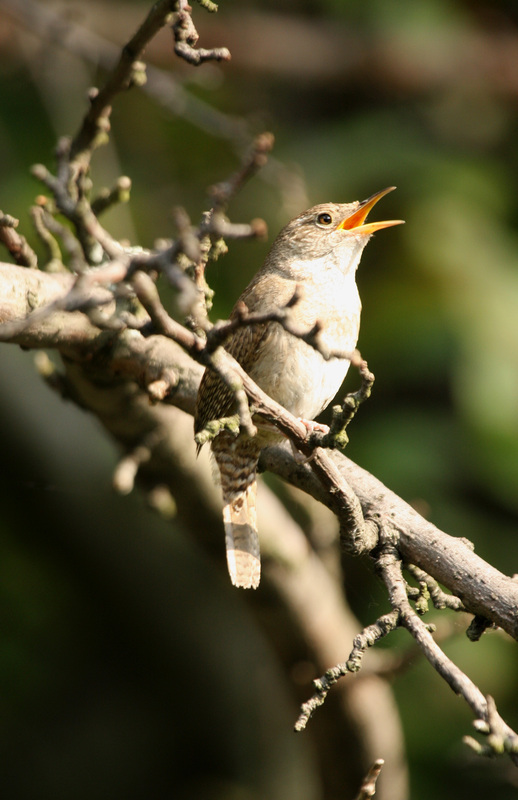 House Wrens are singing less compared to the constant song which announced their arrival back in May. 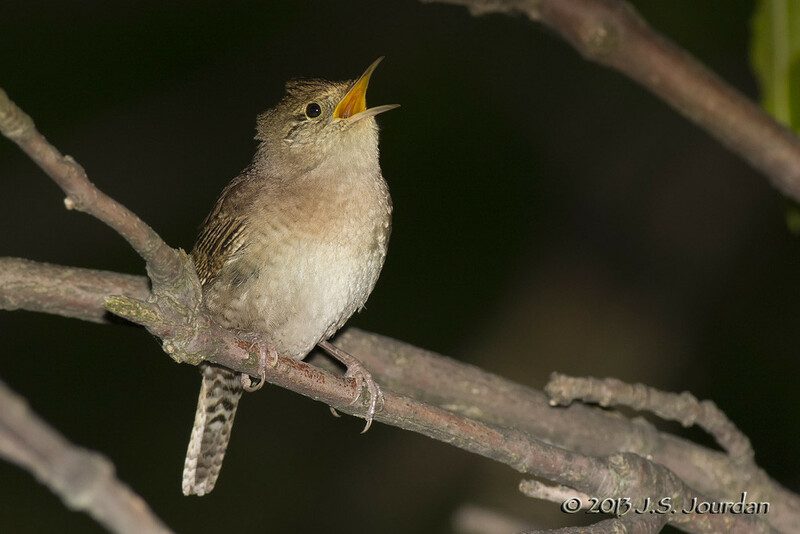 It seems my neighborhood wren gives an earnest song just once or twice these days, and nothing more. Done nesting, there is no need to advertise territory. At this moment, the Robins are the most vocal. Two spot-breasted youngsters are incessantly reminding mom they are hungry. The young can be easily located by their shrill “peek” calls. Mom is quite silent as she searches continuously for food. This is very different from her morning routine. At daybreak, I hear her frantically repeating, “peek, peek, tut, tut.” She does not stop until both youngsters respond, a way to let her know they made it through the night. Heard but not easily seen are my neighborhood Northern Flickers, White-breasted Nuthatches and Chickadees. All of them are making contact calls between adults and fledglings, giving clues as to where they are feeding. The nuthatches seem to be in the most constant contact – soft and repeated many times. Maybe this serves as encouragement to the young, that they are doing well finding the bugs they need. The Northern Cardinal definitely has a second brood of young. How do I know? His song is constant in the neighborhood. He sings from perches in the yards that surround mine, as well as from two places in my yard. These singing points define his territory. When he is closest to the nest site, I can hear the female sing back to him from her place on the nest. 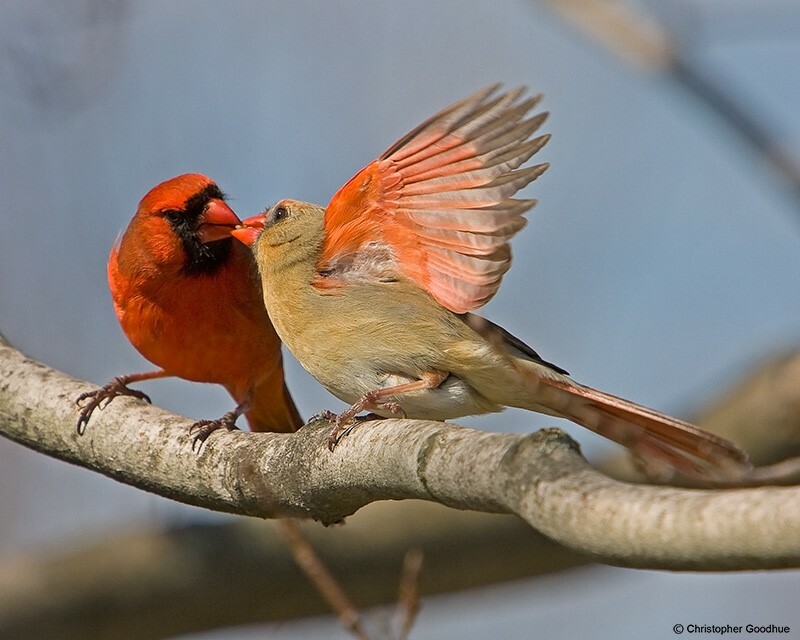 Cardinals are one of the few bird species that engage in counter-singing between the pair. American Goldfinches are in full-on breeding mode. A male makes his presence known, taking flight from the neighbors’ birch trees, singing “per chicory” over and over as he flies. His flight is undulating, a gentle loop up and down, singing continuously. I watch him define his territory, cutting diagonally across my yard, then over two yards, then across towards the fringe of Ferry Elementary property and back to the birch trees. This display is gently repeated about every fifteen minutes. 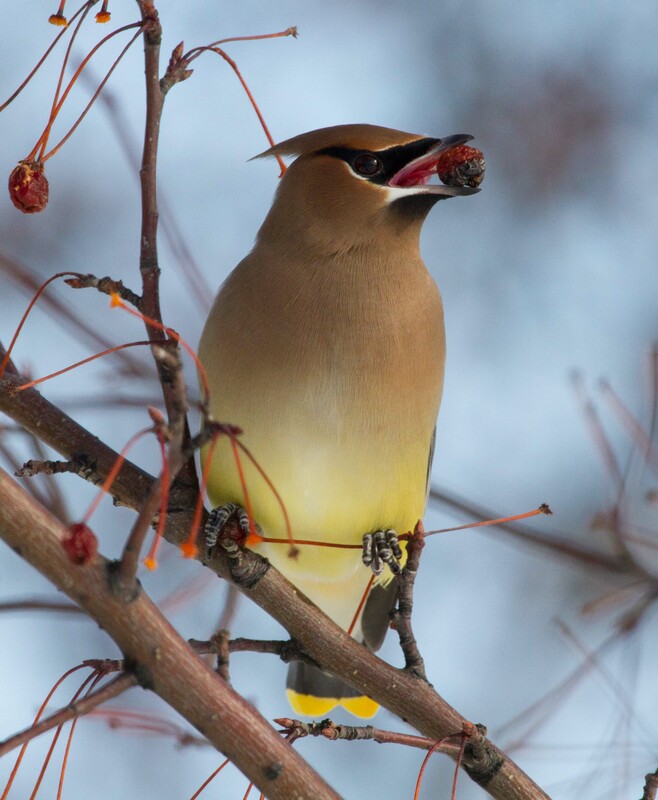 High-pitched calls in the trees overhead give away the presence of Cedar Waxwings. If I watch the area where they are calling long enough, I will eventually see the family group leave in flight together, off to another feeding stop. As evening approaches, I hear the familiar chatter of Chimney Swifts. Gladly, I take a break from the garden and look up, admiring the family group of six that are flying in unison. 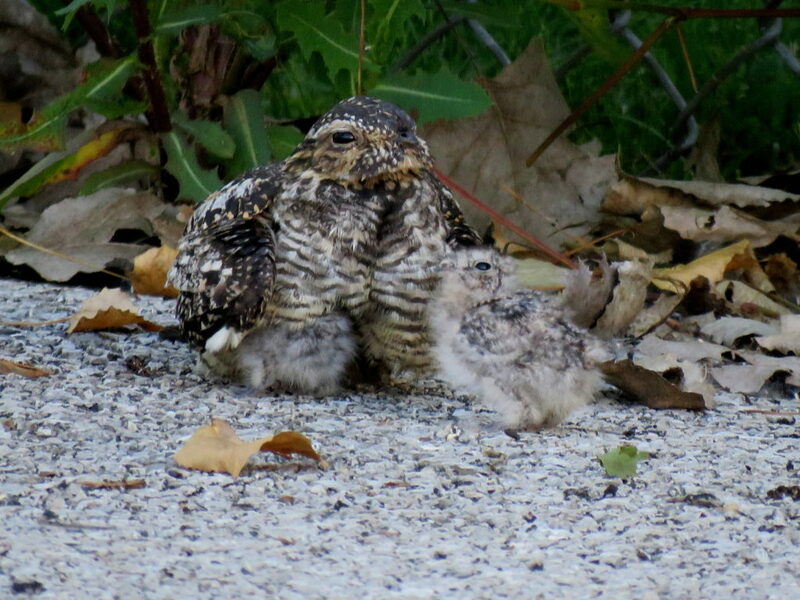 Soon after, I know I will hear the Common Nighthawk’s raspy display call, a sound I will dearly miss once they have migrated this fall. Make your next venture into the yard an auditory experience – you may be amazed at the Joy that listening brings! 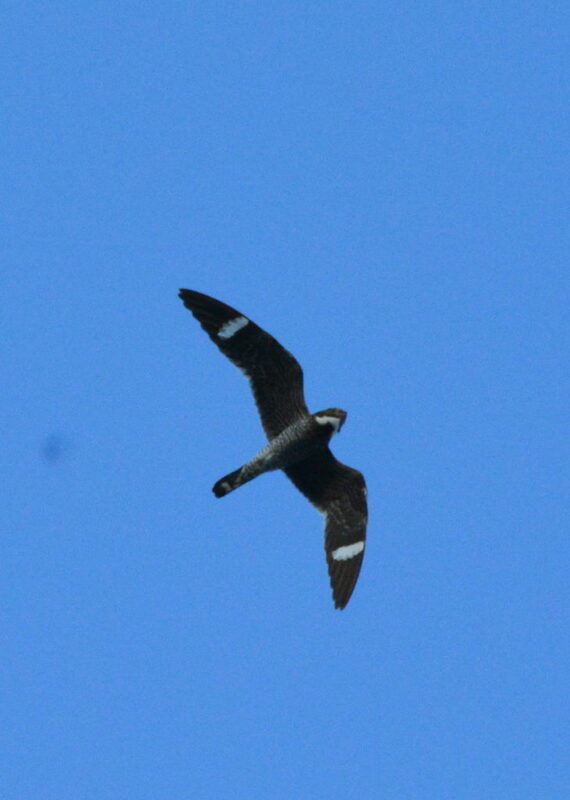 For me, the sounds of summer include the sounds of Common Nighthawks. A pair of nighthawks has nested on top of Ferry Elementary School for as long as I can remember. First thing in the morning, and I mean before sunrise, I see him flying in his erratic pattern. I’m not sure of how to describe the call that accompanies the flight. I’ve seen it written as buzz BEEErzh and peent (click here to listen on Cornell’s All About Birds website). It is sharp and loud, a call to look up to the sky and wait for the wonderful sound to follow. The male nighthawk climbs higher and higher, then dives toward the ground, flexing his wings downward as he peels out of his dive. This causes a sound reminiscent of a race car rounding the edge of the track. To me, it sure sounds like vroom! This wonderful display gets repeated in the evening, a second treat for the summer day. This display serves two purposes; first, to attract a female and bond with her. It also lets other males know the territory is taken. 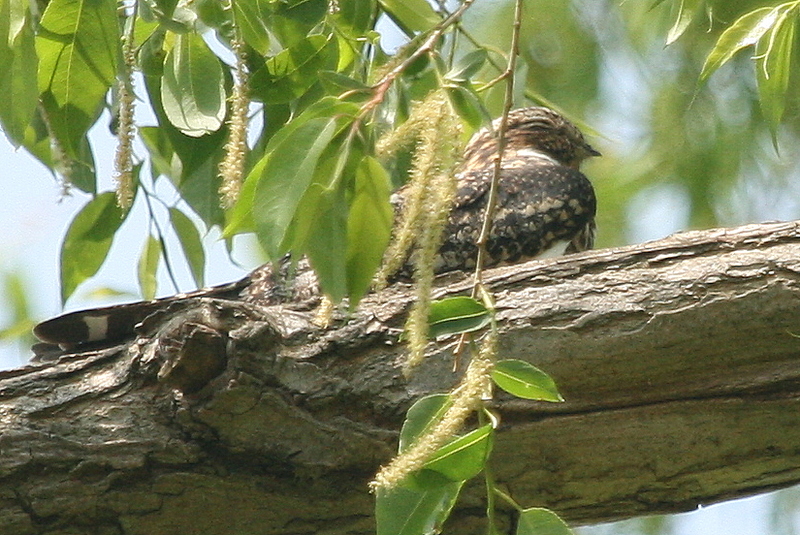 To identify Common Nighthawks, look for a slim, long-winged bird with white patches on the wing. Their pointy wings and streamlined shape make them appear larger than their measurements would indicate. Each bird is typically 9.5” long with a wing span of 24” and a weight of only 2.2 ounces. 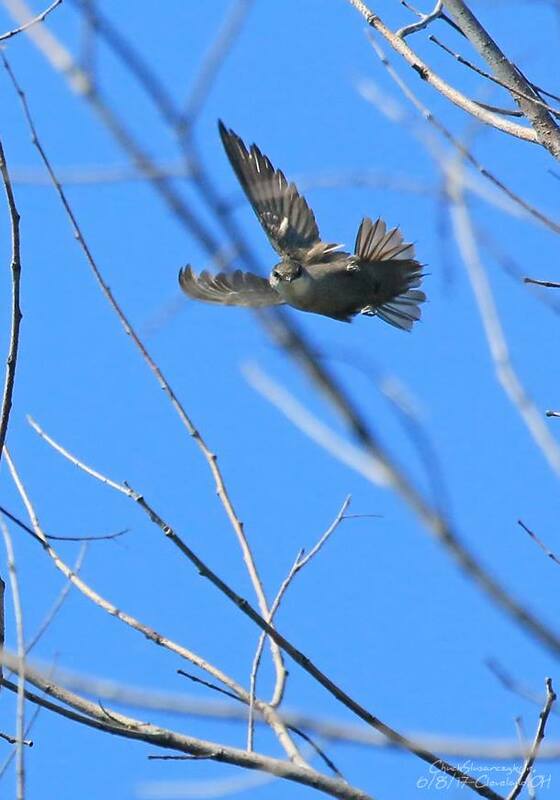 The type of flight is key – erratic and bounding – look for the white patch which is quite distinct in flight. 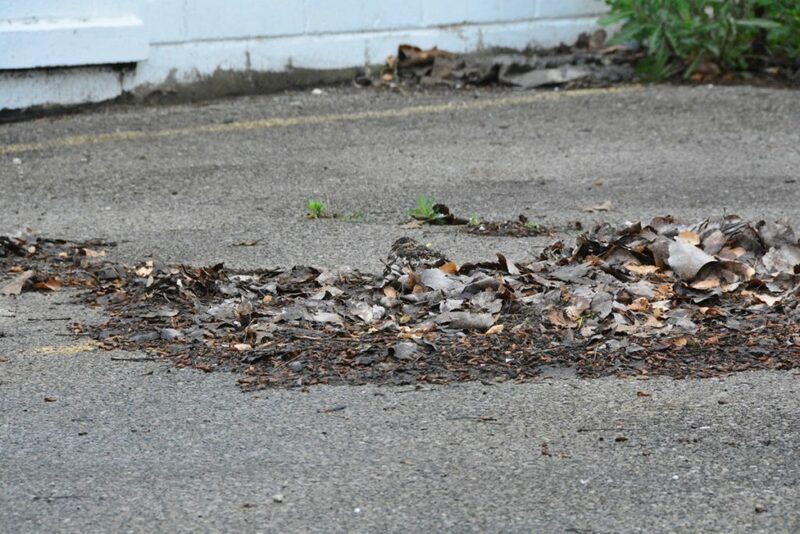 Common Nighthawks nest on open ground, gravel beaches, openings in the forest floor and in our area, on gravel roof tops. 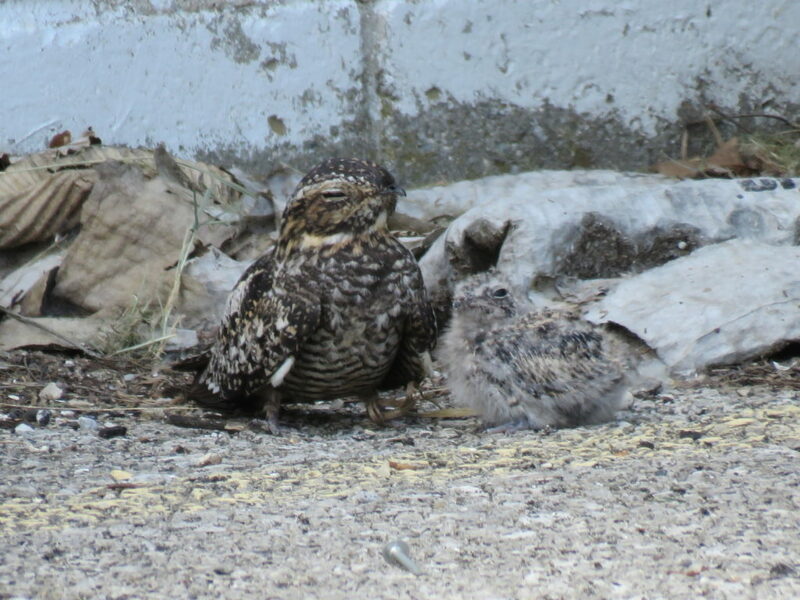 Nighthawks, including the eggs and the young, have excellent camouflage in their nesting habitats. These birds need to be hidden from view, so the trend from older style roofs with pebbles to rubber roofs without pebbles is not a good one. This shift leads to a decrease in prime nighthawk nesting habitat. If you can influence a roofing company to keep a corner of the roof covered in pebbles, we can maintain sufficient nesting habitat. The female lays just one or two eggs at a time, and the pair may have two broods in a season. Females are the primary incubators. At times she will stand over the young with open wings, creating a shade umbrella when needed. 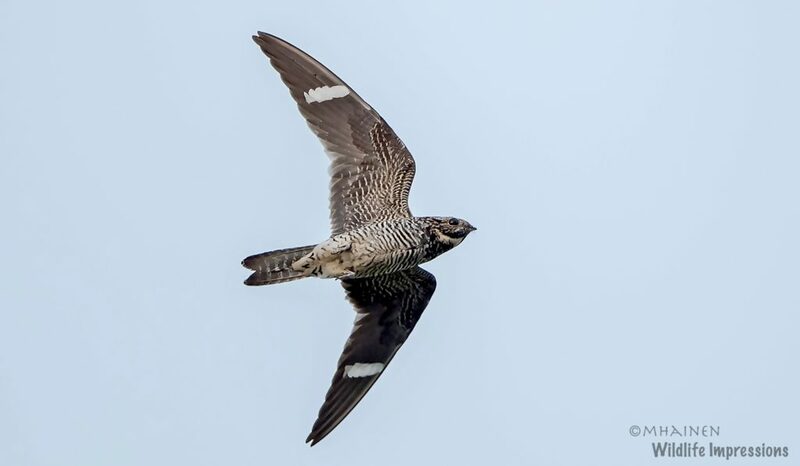 Common Nighthawks eat flying insects exclusively. Once prey is sighted, the bird will fly toward it, open its beak, and maneuver to catch and swallow the insect. The young are fed these insects in regurgitated form – yummy! 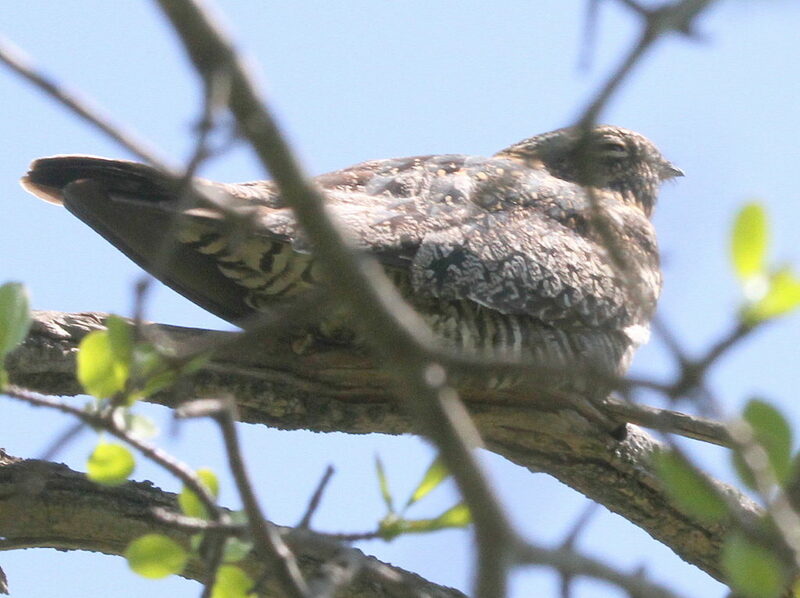 As one would expect of a bird that is an insect-eater, Common Nighthawks migrate south with the change of the seasons. 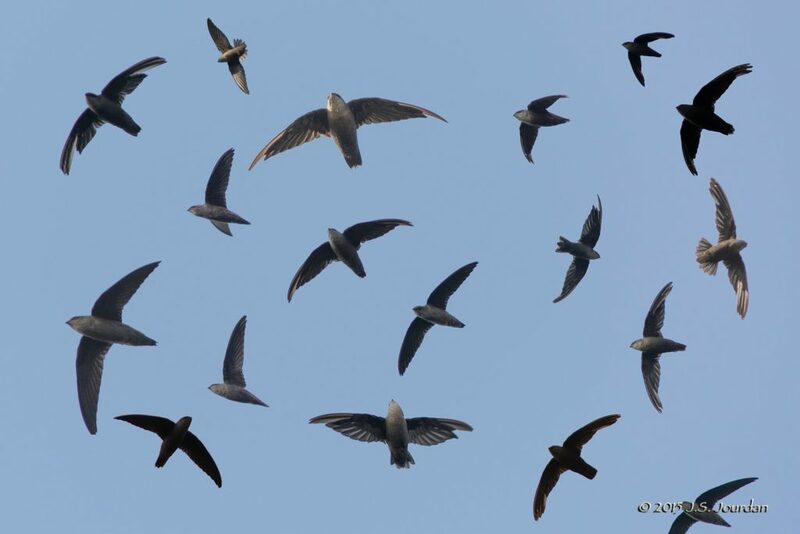 Often in late summertime, Bill Rapai, President of Grosse Pointe Audubon and my co-leader on bird walks, calls to inform me the migration is evident, with streams of nighthawks moving south over Lake St. Clair. Their journey may take them anywhere from 1,600 to 4,200 miles as they have been reported in Ecuador, Peru, Brazil and as far south as Argentina. 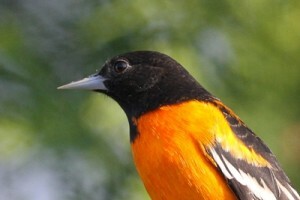 I hope that you get a chance to listen for these unique birds, and then look to the sky and experience these seasonal marvels. “They look like a kindergartner that dressed for school, choosing bright pants that didn’t match the multiple colors they put on,” said my niece after observing a Green Heron at the shoreline of an inland lake. Technically, they aren’t truly green; they have more of a greenish-blue cast to their backs like velvet draperies in an English Manor; a deep chestnut body, a darker, capped head and bright yellow legs. They also have white underneath the tail, most evident when the tail is flicked in agitation. Green Herons wait patiently for prey to cross their paths as they sit perched in every imaginable yoga pose along the water’s edge. Small fish, crustaceans, frogs – all are on the menu. Watching these birds hunt is a lesson in patience and perseverance. They stand for many minutes with necks retracted, their stares fixated at the water in front of them. When prey comes within striking distance, they strike quickly, extending their necks to almost the full length of their bodies. Whatever the catch, the heron flips it down into the back of the beak, then down the hatch in one gulp! 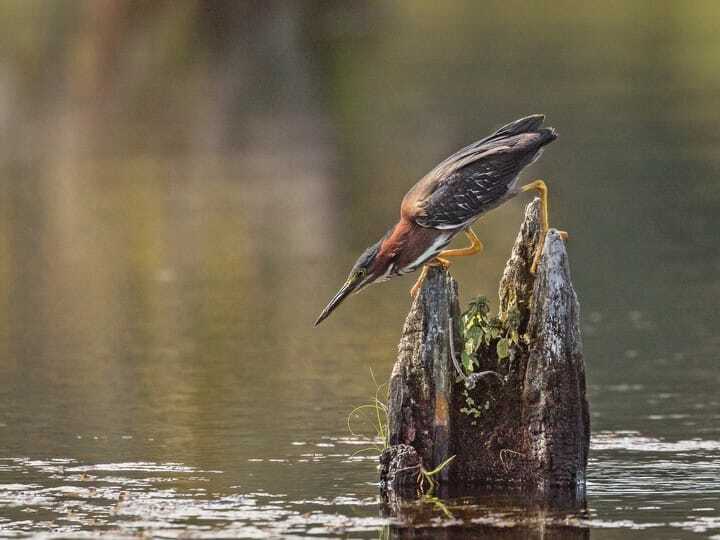 If you are lucky enough to come across them in your outdoor adventures, sit and watch; you may see another behavior that is sure to blow your mind – a Green Heron using a tool to fish. Yes, Green Herons uses tools to lure fish, dropping insects, twigs and feathers onto the water’s surface. This is an amazing sight to see, and one that I have been fortunate enough to witness from the quiet of a kayak. 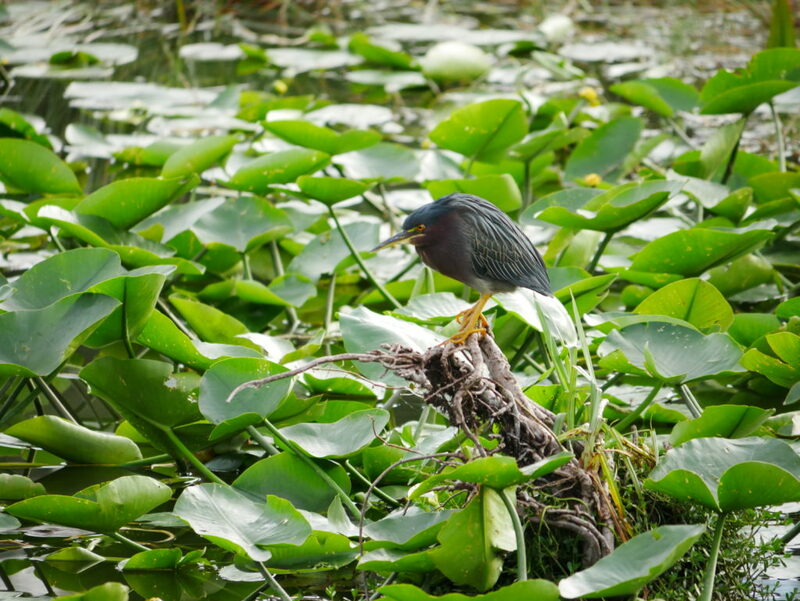 Where can you find Green Herons? They prefer bodies of water with vegetation near the shoreline. Think of our inland lakes and all of the exploring you can do in early morning. Our Huron-Clinton Metroparks are great places for this type of birding. The Edsel & Eleanor Ford House is another likely spot. Use your binoculars to scan the water’s edges, as well as checking lily pads. Listen carefully for a loud “SKEOW!” – a likely sign of a Green Heron relocating. I have noticed they often verbalize while flying from one space to the next. 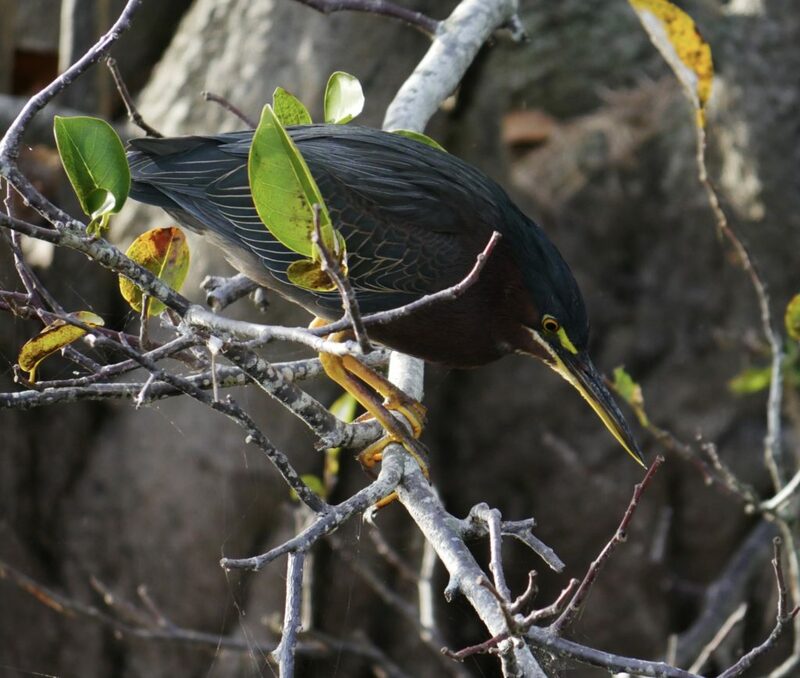 Green Herons make nests from twigs which they situate in trees. Both parents tend to the young. To start, the female lays between 3-5 eggs, and both she and her mate incubate them for 19-21 days. The youngsters are then fed by both parents, who regurgitate food into their mouths. In another 21-23 days, they’re ready to fly. 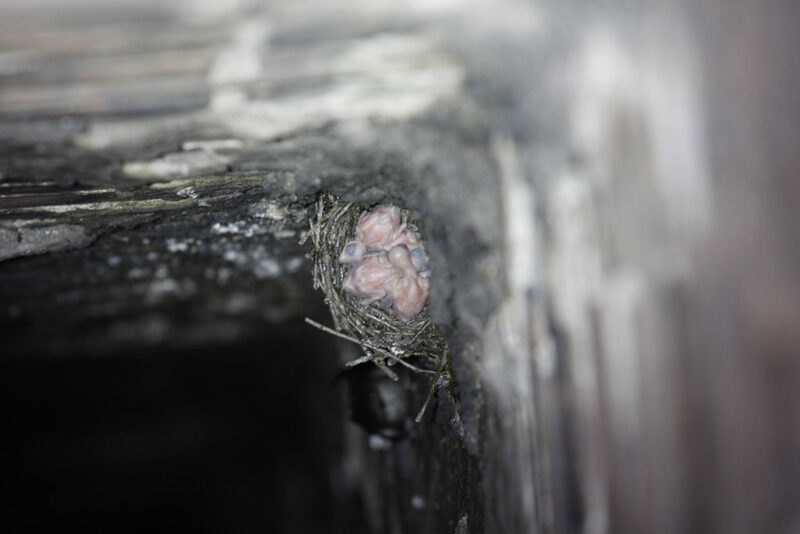 Finally, the young fledge at about 30-35 days of age, meaning they are no longer dependent upon their parents. Green Herons mate monogamously each breeding season, often changing mates from one season to the next. 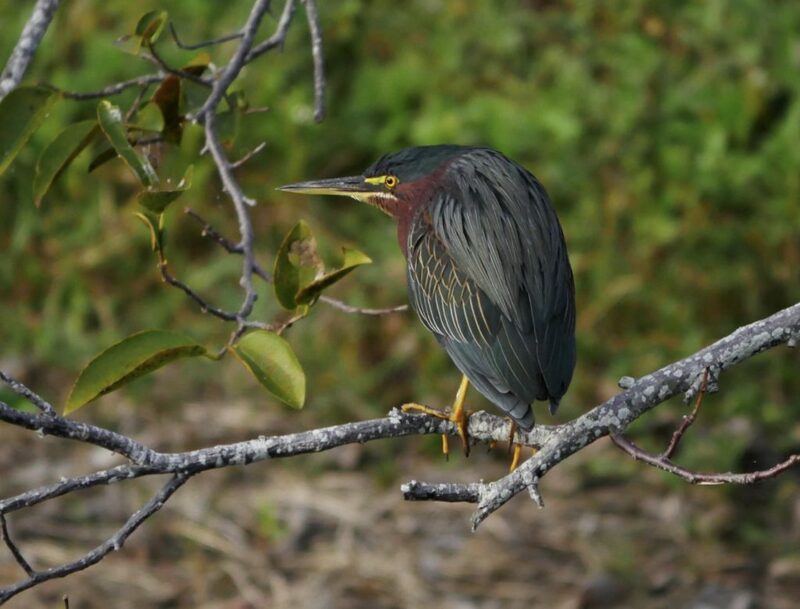 After breeding in Michigan (as well as in other states), Green Herons spend their winters in Mexico and Central America. However, during the post-breeding season, they have been known to show up as far as England and France, which is as exciting for the people there as it is for us when we see a Snowy Owl – what a special treat! 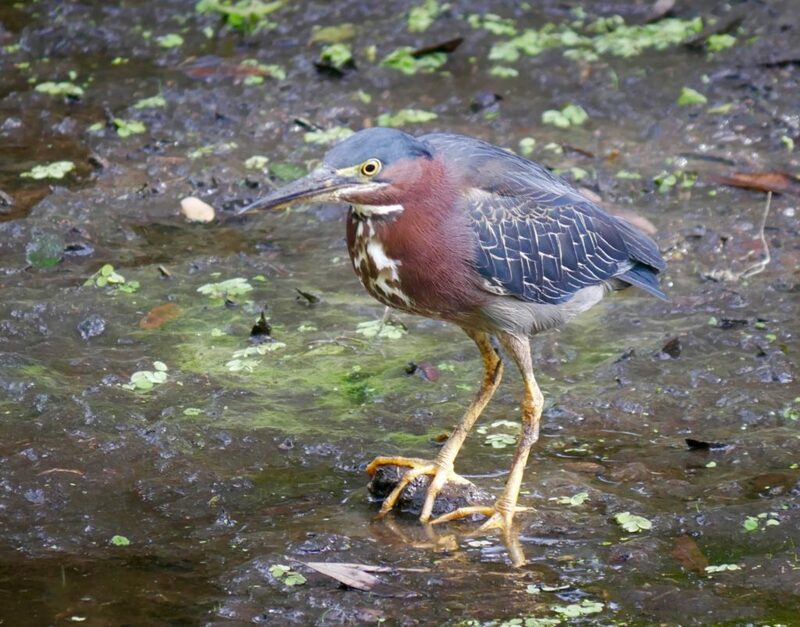 The oldest Green Heron on record was 7 years and 11 months old. 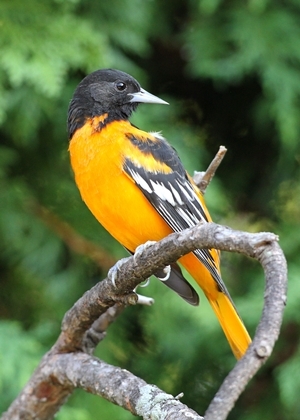 It was found in Mexico in 1979 and first banded in Oklahoma in 1971. Did you know – a group of herons can be called a rookery, a battery, a pose, a scattering or a hedge? Whatever you call them, I hope you see many Green Herons in your forays into the field this year! Cornell Lab of Ornithology. (2017). 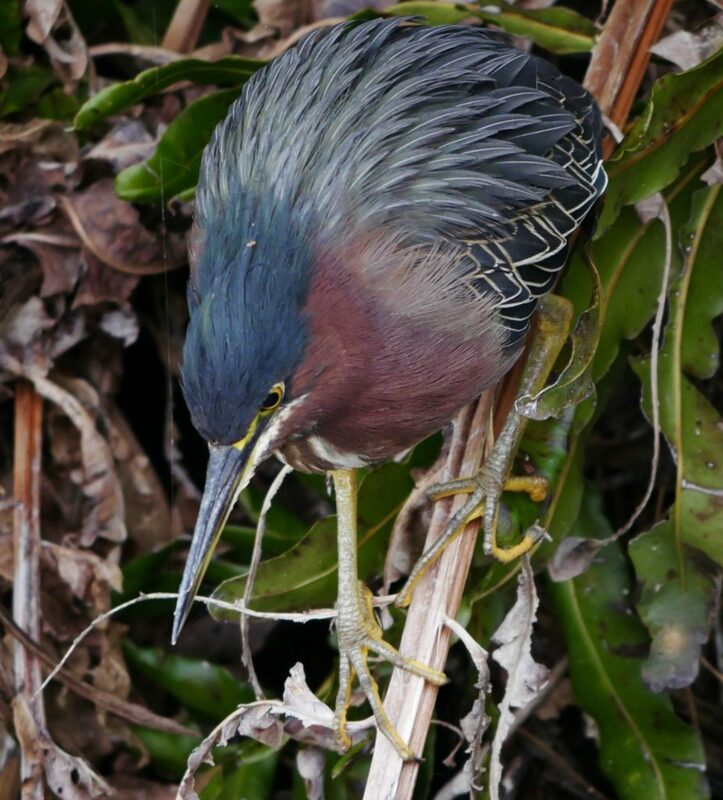 Green Heron Overview. This morning the goldfinch was doing performing his Happy Dance and I watched with delight. It was 7:00 am and I heard short versions of his song being repeated. I looked up to see him making laps around the perimeter of my yard, singing only when his wings beat. With a gentle rolling flight, he finished five laps and then reversed, right over me, much to my delight. Five more laps around the yard in the opposite direction. Per Cher Cher Cher Cher Cher – only on the wing beats, his golden body undulating upward in flight. I am smitten. Does he love my yard for the food it brings to him and his perspective mate? Is he showing her that this is his prime territory? He alights on the wires and sings a much longer version of his song. Looks down on me as if to ask me to leave so be can feed on the Rudbeckia, where I flushed him from a few days ago. 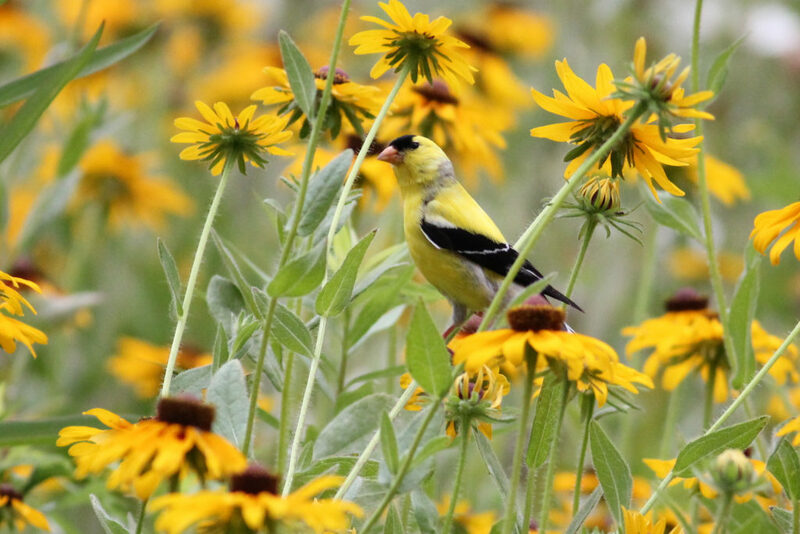 It pays to plant native plants as they are a natural way to feed these golden beauties. He crosses from the wire to the from oak tree, still in plain view, and sings his long song again. 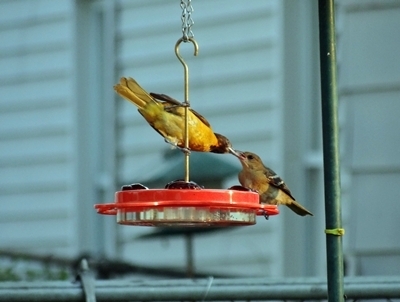 Go birding in your yard! It was a happy day when David Oliver stopped in at Wild Birds Unlimited in Grosse Pointe Woods to show me the photos he had taken of the Cliff Swallows at local Parcells Middle School. I hadn’t heard about these birds so I stopped at the school on my way home to see them for myself. 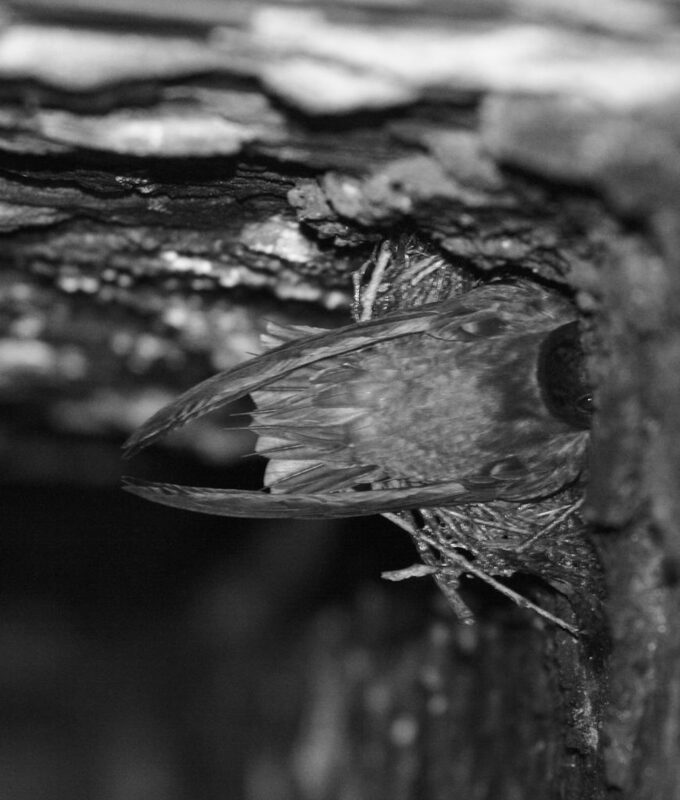 What little beauties, flying about together for insects, their young waiting in the colonial nests these birds build. 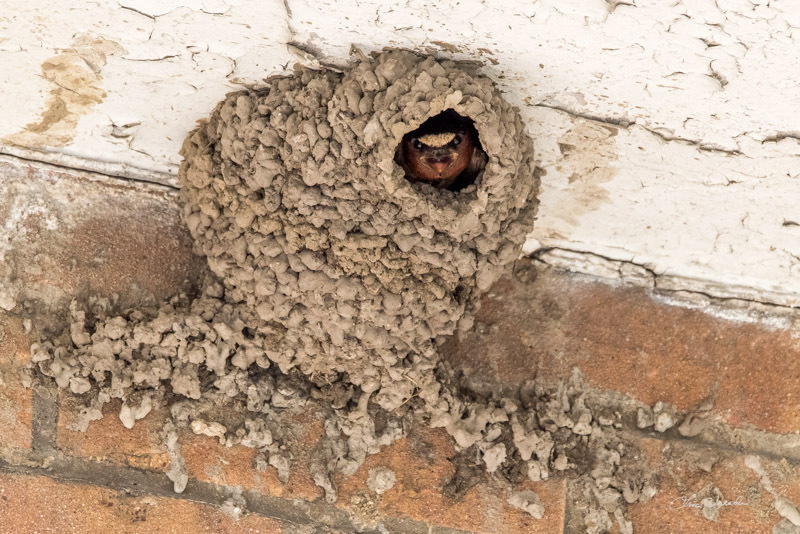 Cliff Swallows are one of the birds that have adapted to changes humans have made by building their mud nests on bridges, overpasses and many other brick surfaces. 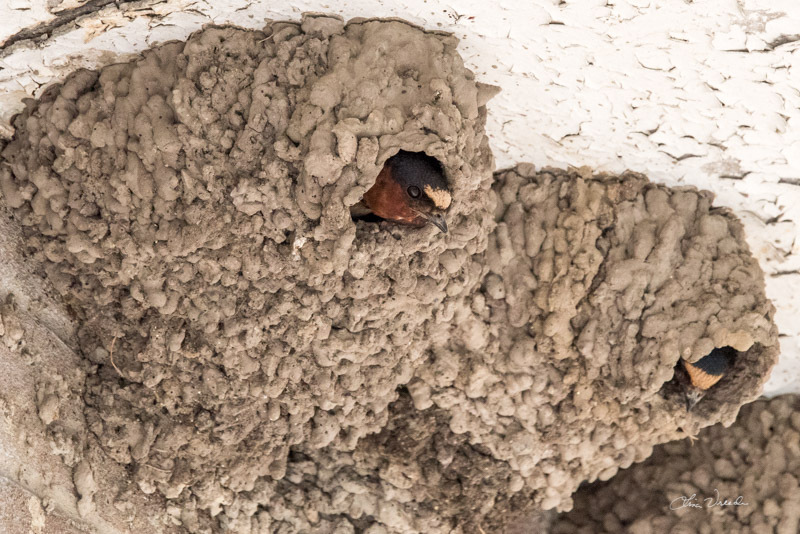 Cliff Swallows use their beaks to gather mud, using about 1,000 blobs to complete their nest. 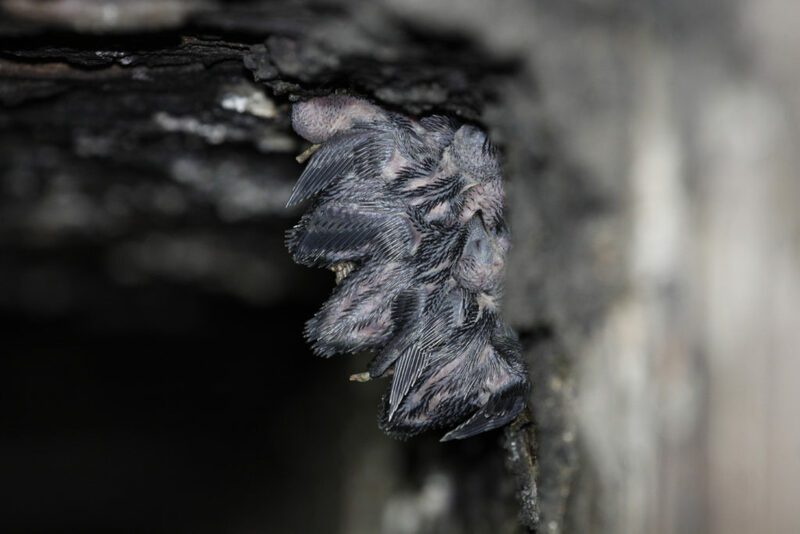 The reasons for nesting in colonies including more birds alert to potential dangers that can alert the group, and more scouts for food supplies. 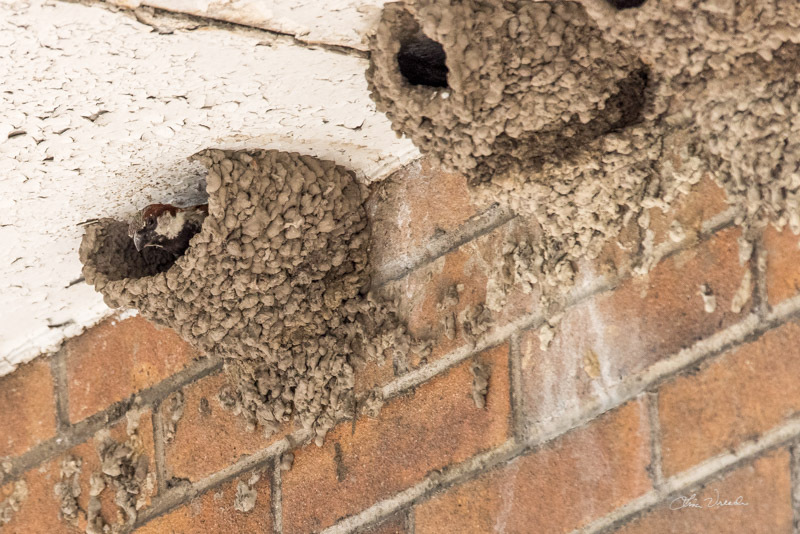 One such danger includes House Sparrows invading and taking over Cliff Swallow nests. Swallows always catch their insect prey while flying, which can be referred to as hunting “on the wing”. 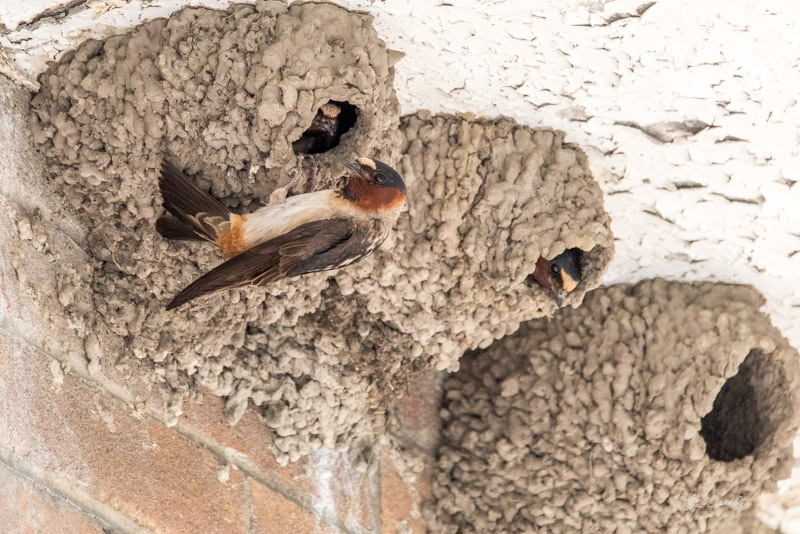 Cliff Swallows eat flying insects all year round, foraging above grassy pastures, plowed fields, and other open areas, but also over floodplain forests, canyons, and towns—often taking advantage of thermal air currents that bring together dense swarms of insects. I imagine the fields at Parcells and the Lochmoor Club offer a good habitat for the insects they seek including flies, bees, wasp, ants, beetles, lacewings, mayflies, butterflies, moths, grasshoppers, crickets, dragonflies, and damselflies. Cliff Swallows tend to forage higher in the air than Barn Swallows, which can be seen skimming just above the ground, especially behind the lawn equipment which causes insects to flush. Cliff Swallows preen their plumage, feed, drink, and bathe in groups, and they continue sticking together in large flocks during migration and on their wintering grounds. These beautiful swallows will be here only for the summer as they will migrate back to a place where they can find insects the rest of the year, in southern South America. Cliff Swallows migrate during the day at a low altitude and feed during migration. 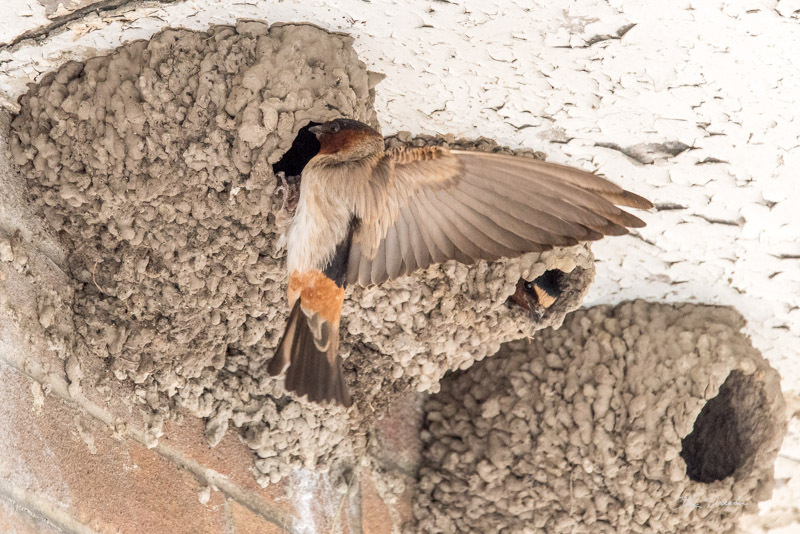 Click the link below to check out an AMAZING video by Cornell Lab of Ornithology, featuring Cliff Swallows building their mud nests… how cool is that! I love sitting in my yard at daybreak. It’s an amazing way to greet the day. A summertime foray into the yard at sunrise reveals a wealth of bird songs. There are the resident bird families that are foraging together, as well as the migrant birds that are returning south after breeding in our food-abundant continent. A European Starling sits alone on the phone wire, beak to the sunrise, it’s raspy short notes singing hail to the day. The Cardinal bursts forth with repeated songs. It takes a lot of energy to keep singing all of these months. He started in late January as usual. Although he does not sing as often as when he and his mate are breeding, there is still sporadic song throughout the day and always at dawn. I wonder if it is a territorial marker continued, letting other families know that this family of Cardinals feeds in the area delineated by song. What a treasure to have that melodious sound in my yard for so much of the year. “Chatter, chatter, chatter”. 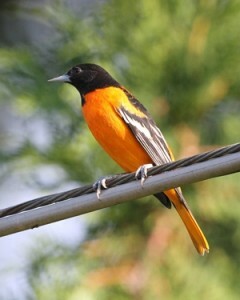 No sign of him, but it’s an Oriole for sure. The confirmation comes with a shortened version of his song. 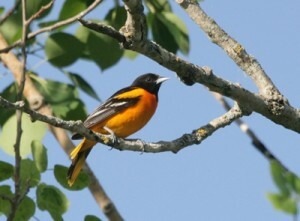 This morning, I am surprised by another male Oriole singing a longer song from the hedge of berry bushes behind me. 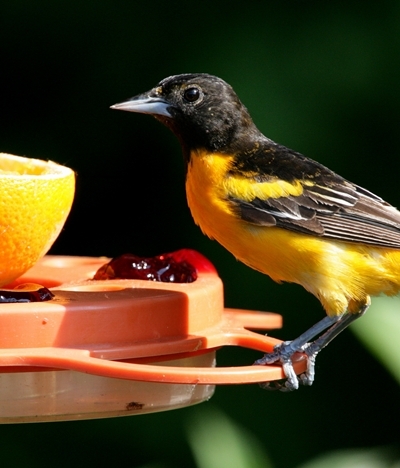 The Orioles aren’t going to find many berries left. The Eastern Kingbirds came by and stripped them clean. That was another wonderful morning. The distinctive electric song was being given by all four members of the Kingbird family. They sat on the wire and verbalized, went to the hedge to eat, back to the wire again, sometimes preening for a bit. It was a great two days to sit and listen to their raucous contact calls. The resident White-breasted Nuthatches are just the opposite. Instead of songs, I hear them giving quiet contact calls to their young. When they move through the yard, you can always tell what area they are feeding in because of this verbal behavior. Another summer resident in the yard has been the House Wren. The contact calls made by the parent to the fledged youngsters is consistent and harsh, much unlike their effervescent song during breeding season. Then there is the Blue Jay youngster with the constant “wa” call which he makes into two syllables. I think he is definitely asking parents for some breakfast help. My eyes turn skyward in response to the light version of the twittering calls of Chimney Swifts. I often see this family of five in the morning, racing across the sky and feeding as they go. Another familiar sound keeps my eyes lifted. It’s the breeding family of Cedar Waxwings. They fly from the oak, to the birches, and then take off, all of them calling together as they fly, a high-pitched, trilled “bzeee”. Soon the hedge in the back reveals the House Finch family has arrived. Their sound is so bright and happy. It’s a joy to listen to baby House Finches. I think it has the same touching quality as the sound of human babies laughing. Later in the morning line-up, the resident Goldfinch belts out his full breeding song. Late nesters, Goldfinches are still in the thick of feeding nestlings. The insistent calls of the young Goldfinches, “Chippee, chippee”, won’t be heard quite yet. Starting my day out by listening to the songs of birds is truly one of the best delights of summer.